We had an amazing time visiting Tenganan village with JED tours. 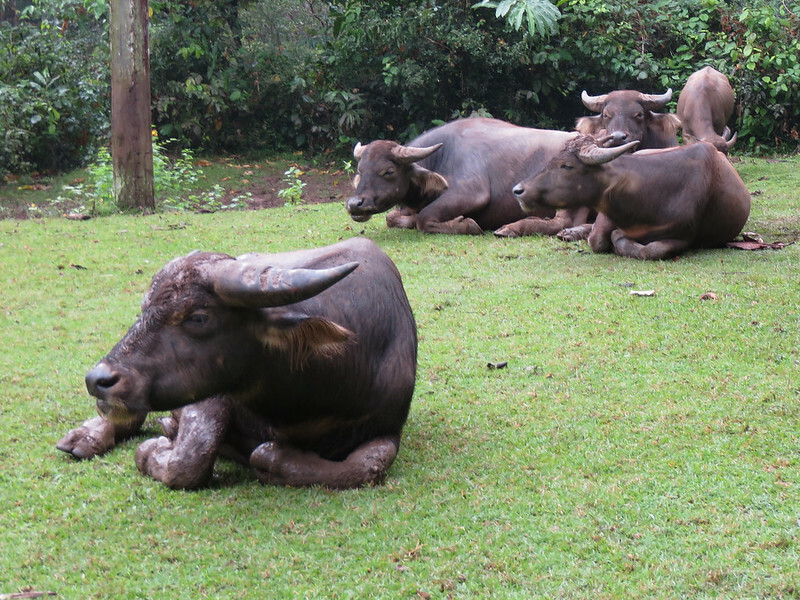 JED tours is a great company; they give 70% of the tour price directly to the village visited. It’s $75/person, which includes lunch and they send a driver who is super friendly and focused on driving to pick you up at your hotel. 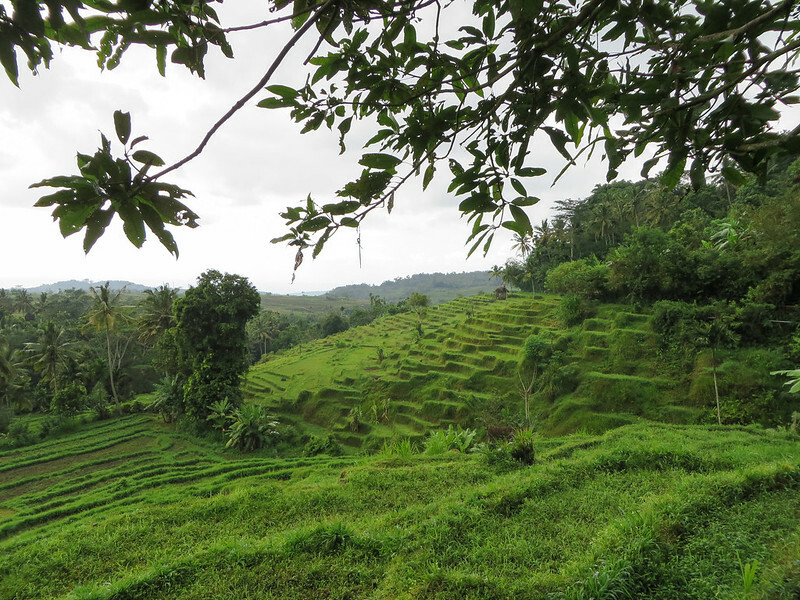 As part of the tour, we went on a few hour trek through some rice terraces; our guide was extremely knowledgeable about all of the plants that we passed on our trek (we learned plants for treating malaria, cancer, and asthma!). I also saw a cashew fruit for the first time; who knew that a cashew nut was attached to such a big fruit! We also stopped at the houses of some of our guides’ friends along the way; our guide would pick up fruits that were precious along the trail and give them to his friends. It was really lovely to be essentially the only people on the hike and to meet so many friendly locals. At one of the houses, we even learned how to weave little baskets using only palm leaves and a metal Coca-Cola lid with holes punched in it. The village of Tenganan was also super interesting. Tenganan has been able to retain its customs from hundreds of years ago; its customs are often studied by sociologists. One of their coolest ceremonies are the mekare kare where the men fight using thorned pandan leaves. They are also known for their double ikat weaving (a process that cannot be taught to outsiders), which is used to make beautiful garments for special ceremonies. We had an awesome lunch prepared by the villagers and were able to visit a man who showed us how he weaves cotton into thread. He literally picked a piece of cotton from a tree in his yard and started weaving it into thread. He showed us the old way, which involves winding the thread onto a stick weighted down by I-ching coins, and the new way, which involves a spinning wheel. I tried my hand at both and both ways were super hard! 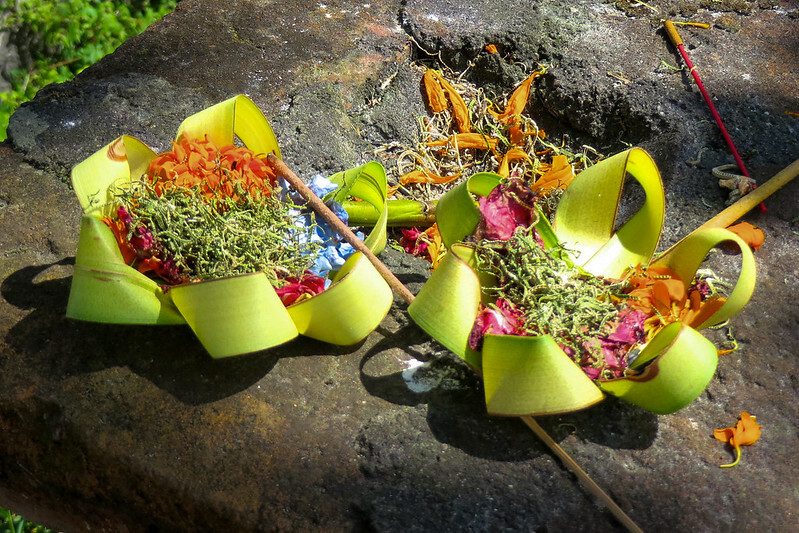 Lastly, I loved seeing these small offerings everywhere in Bali. The main religion in Bali is Hinduism and they take their gods seriously. Offerings are put out in the morning and in the evening so that the gods look kindly upon you. So I’ll end with an offering in the hopes that it might make your day a little brighter.